Nichols Village is a welcoming stand-alone community with rural charm, coastal breeze and urban reach. 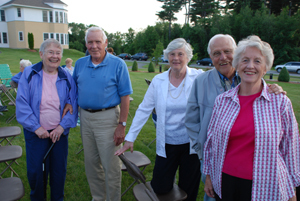 Organized as a private, not-for-profit Massachusetts Corporation, Nichols Village opened in March 2004. After its construction, Nichols Village was nationally recognized in 2005 by The Seniors Housing Council of the National Association of Home Builders and was awarded the Silver Achievement Award for its community design. It is managed by Bethany Community services, a long established, non-profit property management company base in Haverhill, Massachusetts. Our resources are many and our heritage is rich. Thanks to the generosity and foresight of N. Woodburn Nichols and the ongoing contributions from the Nichols Foundation, our residents have the opportunity to live in a peaceful, secure and thriving community.